Jeff Pearson became addicted to heroin more than 30 years ago. Along the way, he racked up 80 drug-related offenses, went to prison five times and made dozens of rehab attempts, including several years standing in line for his daily dose of methadone. In January, Pearson received a prescription for Suboxone, a medication that suppresses the symptoms of withdrawal. Four months later, he’s still surprised he’s not foraging for drugs every day, like he did for so many years. Pearson is fortunate. In New Hampshire, where only a small percentage of people who need help with heroin and opioid abuse can find it, he has access to one of the most elusive treatments. Unlike methadone, which can only be dispensed at specialized clinics, Suboxone can be prescribed by any licensed physician. But, even as opioid abuse in New Hampshire has become an epidemic, relatively few physicians in the state prescribe the drug. As a result, an NHPR analysis of available data found, an estimated 10,000 people in New Hampshire who might benefit from the treatment have no way to legally obtain it. Meanwhile, New Hampshire providers are some of the nation’s most prolific prescribers of the highly addictive painkillers driving the state’s drug crisis. Over a three-month period in late 2015, patients filled nearly 200,000 prescriptions for oxycodone and other opioids, totaling some 12 million doses - or more than 9 doses for every man, woman and child in New Hampshire. The failure of primary-care doctors to treat addiction is not limited to New Hampshire, says Ellen Weber, a law professor and founder of the University of Maryland’s Drug Policy Clinic. Weber says decades of federal regulation have isolated substance abuse from other medical conditions, so most doctors never learn how to recognize and treat addiction. "Physicians feel comfortable in many situations prescribing pain medication, but they don’t do it with a very good knowledge base," Weber says. "Then when their patients have a disorder, they're left to somebody else." Suboxone was supposed to help bridge the gap between addiction medicine and primary care. But it hasn’t worked out that way, and Nicholas Van Loan thinks he knows why. “The biggest reason, and I don’t think you’ll get too many people to openly say this, is they don’t want to treat drug addicts,” he says. So, Van Loan started a Suboxone practice in Concord. Some of his patients come to his office once a month; others, once a week. Van Loan provides 30 minutes to an hour of individual counseling and a prescription refill. Van Loan says he still fields calls from primary-care providers who don’t know how and why Suboxone works. The main ingredient, buprenorphine, is an opioid sometimes used to treat pain. It binds to the same brain receptors that are fired by heroin and oxycodone. But as a so-called partial agonist, buprenorphine triggers far fewer of the endorphins that give drug users their high. That’s how it suppresses the symptoms of opioid withdrawal and reduces cravings. Buprenorphine also has a “ceiling effect” - taking more produces no added benefits - so it’s less dangerous and harder to abuse. The naloxone - an overdose-reversal drug - is an added deterrent, countering the effects of buprenorphine if it’s injected. Van Loan says the frequent criticism that Suboxone treatment replaces one opioid with another misses the mark. “This is what people need to understand: they’re not taking it to get high, they are not using it as an addict uses other opioids,” Van Loan says. “The vast majority of my patients take it and feel normal every single day. They get up, they go to work, they take care of their families - everything they wanted to do, but couldn’t until they found a way out of that hole. Chris Hall fell into the hole 11 years ago, when he started using painkillers and heroin. He tried methadone, which he says left him nodding off throughout the day, and after an arrest, he did a 60-day spell at an inpatient program. Last September, Hall, a chef who lives in Litchfield, got a call about an opening at Recover Together, a Suboxone program in Manchester. Because Suboxone can trigger withdrawal if there is opioid in the bloodstream, he had to wait two days before he could take his first dose. He’s been clean ever since, he says. A few years ago, when he was a student at Dartmouth medical school, Jeff DeFlavio wanted to know why more doctors don’t treat substance abuse. He took a survey of family physicians in New Hampshire and Vermont, and published the results in the Journal of Rural and Remote Health. The research showed that, while a majority of the respondents routinely saw opioid-addicted patients, there were barriers. Some reflected the stigma attached to substance abuse, but many were the consequence of addiction medicine’s status as a backwater of American health care. Indeed, concerns that general practitioners may not have the skills to manage addicted patients were built into the Drug Abuse Treatment Act of 2000 , or DATA 2000, which authorizes the use of Suboxone. Under the regulations, Suboxone prescribers must meet certain requirements for certification, including completion of an 8-hour online training course. In the first year after certification they can treat a maximum of 30 patients. They can then apply to treat up to 100 patients. In 2009, when Nicholas Van Loan began his addiction practice, he was one of 38 Granite State physicians certified to prescribe Suboxone. By 2015, a year in which at least 434 New Hampshire residents died of drug overdose, the number had risen to 143. Even with that growth, New Hampshire still has fewer than 11 certified physicians per 100,000 residents - by far the lowest rate among New England states. In Vermont, 38 physicians per 100,000 residents are certified. In Maine, it’s 28. But that’s only part of the problem. A closer look at the data reveals that even the doctors with certification would have a hard time meeting demand for Suboxone. First, the need: Researchers estimated that some 15,000 people in New Hampshire abused or were dependent on opioids in 2012. While not all would be good candidates for Suboxone, the rate of opioid abuse in the state has almost certainly grown in the past four years. Overdose deaths have more than doubled over that time. As for capacity, if all 143 Suboxone-certified physicians treated their full allotment under the law, more than 11,200 patients would have received the treatment last year. As it is, according to an analysis of pharmacy data by Jeff DeFlavio, 57 of those doctors - 40 percent - didn’t write a single prescription. That means fewer than 4,200 people were able to obtain the drug. Moreover, large swaths of the state, especially north of the Lakes Region, don’t have any certified physicians. DeFlavio says the Obama Administration’s proposal to raise the maximum number of patients that certified physicians can treat to 200 is long overdue. But, he adds, it might not have much impact. Few physicians in New Hampshire, where the wait time for every level of behavioral health care for addiction is measured in weeks, can make that promise. Another reason is that primary care offices aren’t set up to handle the demands of medication-assisted treatment. The patients have to be seen at least once a week until they are stable, and they are subject to regular pill counts and urine screens throughout the course of their care. There are also new billing codes and procedures to learn and, like many prescription drugs, Suboxone needs prior authorization from insurance companies, including Medicaid. All of that diverts staff attention away from other patients. The largest Suboxone program in New Hampshire is ROAD to a Better Life. It has 10 locations across the state, with 19 certified physicians who see an average of 75 patients each. ROAD’s Tom Barnes says trying to integrate Suboxone into a traditional practice can be as difficult for patients as it is for providers. Most addicts feel more comfortable around other addicts, he says, and they need to be treated by people who understand their complex needs. But, as the number of deaths and hospitalizations from overdose continue to climb, some primary-care practices are trying to make it work. Ruth James is one of two physicians certified to prescribe Suboxone to patients at Families First Health & Support Center. James and her colleague in Portsmouth, Eric Samuel, are each authorized to treat 30 patients this year. They set a goal of 20 patients between them. Despite the demands on her time, James is relieved the clinic made the decision to offer Suboxone. She counts among her early successes a young mother who, a week after she received her first dose of the drug, managed to pay her bills. Two years ago, DeFlavio decided to take what he learned from his research and launch his own practice. The concept was simple: Set up in urban and rural areas hard hit by the opioid and heroin crisis; hire counselors to conduct group therapy sessions and administrators to handle pill counts and urine tests; and recruit physicians to come in once a week to write prescriptions. DeFlavio has opened six clinics, called Recover Together, in New Hampshire, three in Maine ad two in Ohio. All told, they employ about 20 physicians and treat roughly 900 patients. 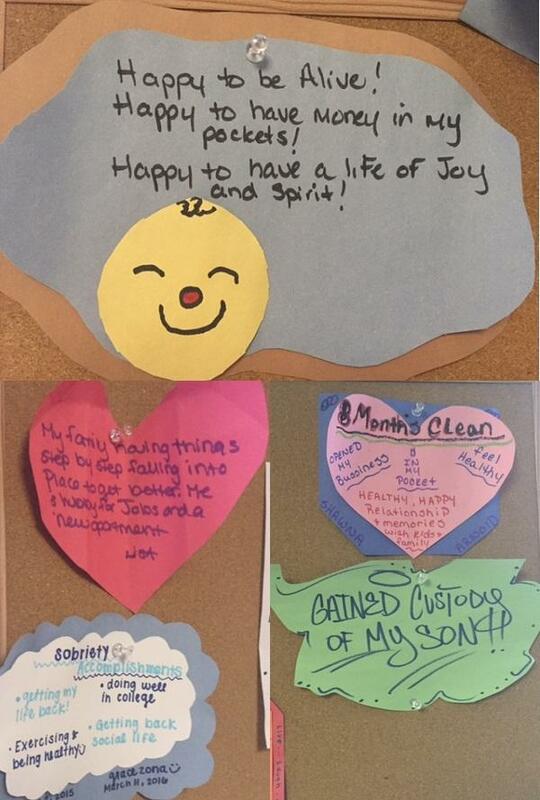 Patients at Recover Together celebrate milestones by posting them on a bulletin board at the clinic. To reduce costs, Recover Together doesn't accept insurance. Patients pay $65 when they show up for their weekly therapy sessions, which are attended by the prescribing physicians. Urine samples are tested on site at every visit, and prescriptions can be filled at a local pharmacy and covered by Medicaid or private insurance. DeFlavio says the model encourages more physicians to obtain or use their Suboxone certification without having to build addiction treatment into their existing practices. Donald West, one of the first New Hampshire physicians to be certified to prescribe Suboxone, is Recover Together’s medical director. He started a program years ago at Dartmouth-Hitchcock Medical Center using psychiatry residents to conduct group therapy sessions. West says Recover Together is based on that model, which makes counseling available to more people than most other treatment programs can accommodate. West applauds President Obama’s proposal to increase the cap on patients that can be treated by certified physicians. He’s hoping federal health officials will go further by allowing non-physician providers, who prescribe a large percentage of opioids for pain relief, to prescribe Suboxone as well. “There is no reason in the world, at all, that nurse practitioners and physician assistants should not be allowed to prescribe,” he says. 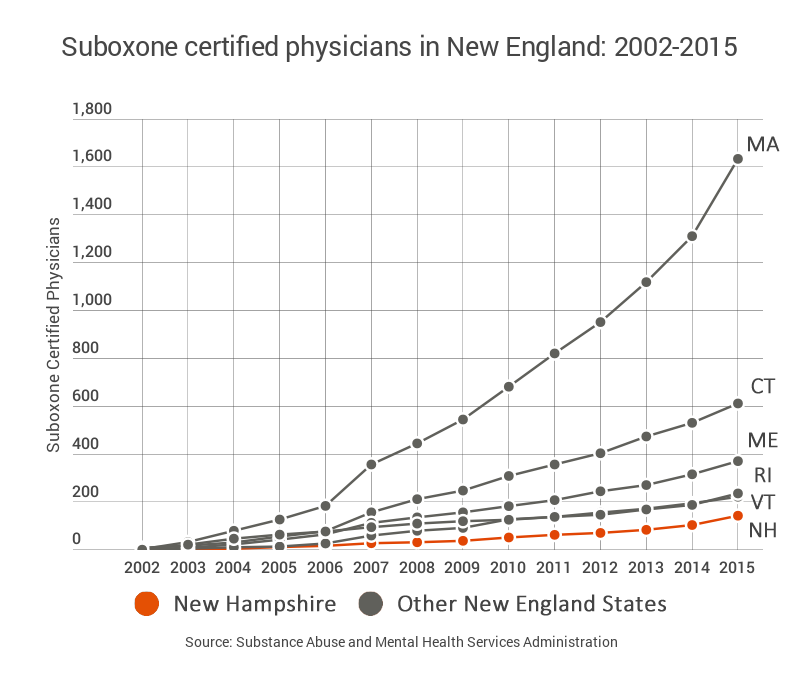 In the meantime, state health officials are trying to encourage more primary-care and family physicians to incorporate Suboxone treatment into their practices. The Department of Health and Human Services is working with the New Hampshire Medical Society to recruit more physicians to become certified, and earlier this year, the agency released an extensive guide. Among its recommendations is that certified physicians build “working relationships” with counselors in their communities so the federal behavioral-health requirements can be more easily met. And, for first time, DHHS is funding Suboxone treatment at state-funded health centers. Last year, the department spent $100,000 to subsidize treatment costs, which are $150-$200 a week per patient. This year, four centers were promised funds for Suboxone from $11.5 million in new state and federal grants. Joe Harding, director of the Bureau of Drug and Alcohol Services, says the state is committed to making Suboxone more available. But ultimately, he says, the state can only do so much. Toggle between the layers of the map to see where overdose deaths took place in New Hampshire in 2015, and how many patients were treated with suboxone during a 30-day period in New Hampshire towns. For a better experience on mobile, turn your device sideways. CVS Health is the latest pharmacy chain to offer the overdose reversal drug naloxone, known commonly as Narcan, at its stores in New Hampshire. The New Hampshire Senate today will once again tackle a handful of bills geared at the state’s opioid crisis. Many of the proposals being related to illegal drug use. U.S. Attorney Emily Gray Rice and New Hampshire’s Attorney General, Joe Foster, will work together to prosecute drug overdoses as crime scenes. The goal is to charge drug dealers with homicide, when an overdose death can be linked to a drug sale. The collaboration will expand resources for state prosecutors and allow New Hampshire drug dealers to be charged under federal law, which has tougher penalties for drug crimes. The manager for New Hampshire’s prescription drug monitoring program told lawmakers Tuesday that more funding would help the system to better handle an expected increase in use that could come with efforts to more closely monitor opioid prescribing. As part of a special legislative session on heroin and opioid misuse, Gov. Maggie Hassan and Senate Majority Leader Jeb Bradley have each proposed giving the program $100,000 in state money to help with technology upgrades that would encourage more widespread use.